"Inspectors found over 700 rodent droppings so it was clearly a problem," ABC Action News anchor Wendy Ryan told Julie. "Oh wow! That's a lot," Julie responded. Ryan went inside the restaurant to get some answers and met Bombay's Manager Ashu Kumar. "Did you know you had rodents inside the kitchen and underneath the buffet?" Ryan asked. "No, no issue," Kumar said. "You had no idea?" she questioned again. "No, not any rodents are here," he explained. 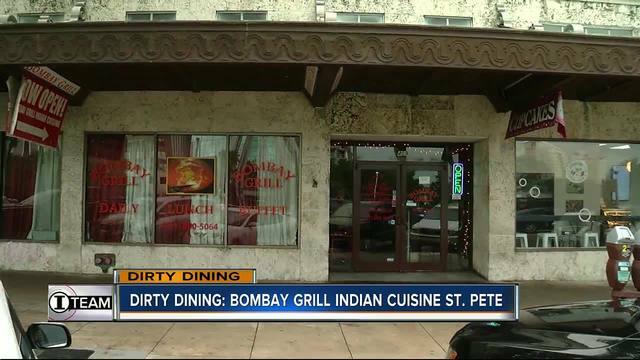 Kumar said he's worked at Bombay Grill for three years. "They shut you down because you had a rodent problem," Ryan explained, as she showed him the inspection report as proof. "It's not our problem. It's a property problem," Kumar said. "It's a property problem? The building?" Ryan asked. "It's a building problem, not our problem," Kumar answered. "So you fixed all of that too?" Ryan asked. "Yeah, we ordered a new one," Kumar said. "So you've cleaned everything up?" Ryan asked. "And customers should not be worried?" Ryan questioned. "I suppose I would still be reluctant. If it was under new management, possibly I might try it," she said.